Drew Ferris will never forget the day Will Muschamp made him cry. They were tears of joy. All of the pent up emotions from Ferris’ football career had built up to that moment when the Florida Gators’ deep snapper was awarded a football scholarship. Ferris had transferred from a large public school to a tiny private school to play eight-man football. As a senior, he was part of a winning squad on the only Jewish 11-man high school football team in the country. He found a niche as a deep snapper, practiced with his high school coach and specialist Chris Rubio, who told then-UF special teams coach DJ Durkin about Ferris’ abilities. Ferris decided to walk-on at Florida, a coast-to-coast move and culture shock from San Diego, Calif., to Gainesville. He killed himself in offseason conditioning and in practices until he earned a starting spot with the team. Then on April 5, the day before the Orange & Blue Debut spring scrimmage, Muschamp delivered the news. 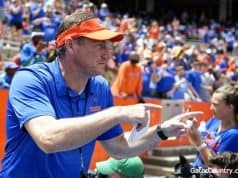 “The juice was worth the squeeze as they say,” Ferris told GatorCountry.com in an exclusive interview. In his head, the 6-foot-1, 211-pound Ferris wondered why his name even came up. As a deep snapper, his contributions to the team often are overlooked. “You don’t hear your name like that too often, so I was kind of caught off guard,” Ferris said. “Then he looked at me and said, ‘From this day forward you are now on a full scholarship at the University of Florida.’ And I just broke down in tears. A “huge weight” immediately was lifted off of his shoulders. It also lessoned the burden on his parents’ pocketbook as out-of-state tuition can cost around $38,000 per year, not counting all of the other costs associated with sending a son or daughter away to college. “Drew has a really strong sense of responsibility and felt bad about us paying out-of-state tuition,” said Walt Ferris, Drew’s father. “We filled a lot of empty cans and bottles and scraped by, but we knew it was important to him. We knew he had the character and quality and traits to make it happen. It took some time before Drew could connect with his parents to tell them the awesome news. They were in Israel visiting his sister, who lives there with her boyfriend. They were in a remote area where their cell phones did not work. Drew had to tell somebody. He phoned his grandmother, but she didn’t answer. He then began calling and texting his aunts, other family members and friends. Still, he wasn’t able to tell the people he wanted to share the news with the most: his parents. Finally, his mom, Pam, logged onto Facebook. On Drew’s wall were messages congratulating him on the accomplishment. The work began well before he arrived at UF. Drew Ferris transferred from a public school to San Diego Jewish Academy. His junior year the Lions were playing eight-man football. He lined up as a defensive end, middle linebacker, offensive tackle and where ever else his team needed him. A new coaching staff and a switch to 11-man football as a senior resulted in a trip to the playoffs and a 6-3 season. Drew earned all-conference honors for both defense and offense. As the lone Jewish high school team in the country, the Lions had an interesting advantage over opponents. In the meantime, Drew began working with Chris Rubio, one of the nation’s foremost experts on deep snapping. He eventually became a five-star prospect as a deep snapper. When Rubio was contacted by Durkin — who was searching for Florida’s next deep snapper — he offered up Drew Ferris’ name. Drew was offered a spot as a preferred walk-on, which meant no athletic scholarship money. It was a difficult decision to leave sunny southern California (his home actually is in Carlsbad, Calif.) for The Sunshine State. After all, it’s more than 2,300 miles away. To drive it, it would take about 33 hours. The few direct flights from Orlando to San Diego are expensive and keep you in the air for five hours. It was a long way from home for the long snapper to travel. Still, he decided to accept the offer to walk-on at Florida, becoming the first Division-I male athlete from his high school. 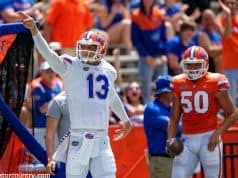 At Florida, Drew quickly connected with punter David Lerner, whose family became his “second family,” according to Walt Ferris. He made tons of new friends and experienced life away from home for the first time. In his spare time, he likes bowling, fishing and music. He said he likes to “jam out” on a guitar from time to time with teammate and roommate Christian Provancha, who also plays guitar. His other roommate/teammate is Chandler Carr. On the football field, Drew redshirted as a true freshman in 2010. He won the starting job that offseason and served as the deep snapper on punts and field goals in all 13 games. All of his sacrifices and hard work paid off the following spring when he was awarded a scholarship. The date was Sept. 1, 2012. Trying to make a play for his team in the fourth quarter of the season opener against Bowling Green, Ferris raced down the field after snapping the ball to punter Kyle Christy. Speedy gunner Louchiez Purifoy arrived first to knock the ball loose from the returner. Ferris quickly scooped it up and began rambling toward the end zone before being tackled from behind. His left shoulder was driven into the Florida Field turf, fracturing his clavicle (collar bone). He heard it “pop” and the sound was something he’ll never forget. The pain was intense as fans can tell by watching the WCJB replay, which shows Ferris being helped to the sidelines by the team’s medical staff. However, when he heard the prognosis that it would take three months to fully recover, the pain switched from physical to emotional. The pressure that comes with deep snapping is intense. About the only time a deep snapper gets mentioned by the media is if they make a mistake, or suffer an injury. A bad snap usually equals a big play for an opponent. There’s zero margin for error. Walt Ferris likened the motion to that of a quarterback, throwing a two-handed spiral backwards between your legs. Ferris has fully recovered and has been cleared to practice. He’s been on campus three seasons, but has only played one. He will apply for a medical redshirt to get this past season back. If approved, Ferris will have three more years to play football despite technically being a junior from an academic standpoint. That said, Ferris hopes to pursue a master’s degree. He’s majoring in psychology and is even thinking of adding a double major in business or business management. He’s still not exactly sure of the career he plans to pursue. Walt Ferris is a psychotherapist and Pam Ferris is the CEO of a non-profit retirement community, so it sounds like Drew may end up in a career that is a combination of what his parents do. No matter what avenue Ferris chooses, his parents will be there to support him — even from a couple of thousand miles away. “We couldn’t be any prouder of him,” Walt Ferris said. If he ends up getting a chance to play in the NFL, then he certainly will explore that option first. NFL deep snappers can make upwards of $1 million per year because it’s a craft so few can master. For now, he’s just going to keep enjoying his college experience while staying focused on the task at hand. Mike Capshaw brings a wealth of experience to the Gator Country team. He’s been overseeing all editorial aspects of GatorCountry.com and Gator Country magazine by managing our team of staffers, interns and freelancers. He is now moving into a bigger role as a reporter by covering the football and basketball beats as well as providing coverage of all sports on campus. Mike’s 15 years in the business has included more than six years of covering SEC sports and recruiting at a daily newspaper in Arkansas. He has also helped launch a newspaper, magazines, websites and even a sports talk radio show. Because Mike puts family ahead of his career, he left the place where he was established when his wife received an opportunity to further her career at UF. He took a leap of faith that he could find a job in the Gainesville area and worked for a year at a newspaper group before joining the Gator Country family in November, 2011. Mike has won Florida Press Association awards for Best Sports Game Story and Best Sports Feature Story in the past two years as well as a company-wide award at his former newspaper group that includes some 60 publications, for Excellence in Sports Reporting. You can follow Mike on Twitter at @MikeCapshawGC.